To view the video of the fake CNN report, click here. There was just one small problem with this story: it was fundamentally false, in the most embarrassing way possible. 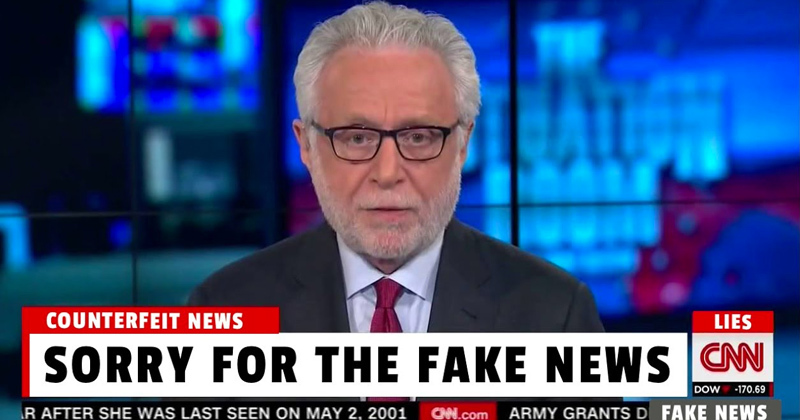 Hours after CNN broadcast its story – and then hyped it over and over and over – the Washington Post reported that CNN got the key fact of the story wrong. The email was not dated September 4, as CNN claimed, but rather September 14 – which means it was sent after WikiLeaks had already published access to the DNC emails online. Thus, rather than offering some sort of special access to Trump, “Michael J. Erickson” was simply some random person from the public encouraging the Trump family to look at the publicly available DNC emails that WikiLeaks – as everyone by then already knew – had publicly promoted. In other words, the email was the exact opposite of what CNN presented it as being. To begin with, it’s hard to overstate how fast, far and wide this false story traveled. Democratic Party pundits, operatives and journalists with huge social media platforms predictably jumped on the story immediately, announcing that it proved collusion between Trump and Russia (through WikiLeaks). One tweet from Democratic Congressman Ted Lieu, claiming that this proved evidence of criminal collusion, was re-tweeted thousands and thousands of times in just a few hours (Lieu quietly deleted the tweet after I noted its falsity, and long after it went very viral, without ever telling his followers that the CNN story, and therefore his accusation, had been debunked). Second, the “multiple sources” who fed CNN this false information did not confine themselves to that network. They were apparently very busy eagerly spreading the false information to as many media outlets as they could find. In the middle of the day, CBS News claimed that it had independently “confirmed” CNN’s story about the email, and published its own breathless article discussing the grave implications of this discovered collusion. Most embarrassing of all was what MSNBC did. You just have to watch this report from its “intelligence and national security correspondent” Ken Dilanian to believe it. Like CBS, Dilanian also claimed that he independently “confirmed” the false CNN report from “two sources with direct knowledge of this.” Dilanian, whose career in the U.S. media continues to flourish the more he is exposed as someone who faithfully parrots what the CIA tells him to say (since that is one of the most coveted and valued attributes in US journalism), spent three minutes mixing evidence-free CIA claims as fact with totally false assertions about what his multiple “sources with direct knowledge” told him about all this.